The 2016 Colorado State Fair is offering money-saving discounts every day to help the Fair fit within the family budget. "Tickets to most Colorado State Fair events include gate admission and access to our many free attractions," said State Fair General Manager, Sarah Cummings. "Plus, we offer a wide variety of daily deals and discounts to give fair-goers even more value for their dollar." Free gate admission and $15-discounted carnival ride band. Passes will be distributed to administrators in School District 70, District 60 and other participating schools. Includes free Loaf 'N Jug drink and ticket to a select CSU-Pueblo football game. For $25, you get 2 rodeo tickets, which include gate admission and 2 beverages (must be redeemed at the Grandstand). Drinks can be anything--margarita, Budweiser, water, or Coca-Cola. That's a saving of as much as 50 percent! Celebrate the end of summer with this spectacular special. Buy a coupon for a discounted State Fair gate admission ticket for $5 at any participating Loaf 'N Jug store. The ticket is good Monday thru Thursday and Labor Day. The 2016 Colorado State Fair will mark the Fair's 144th year as Colorado's premier celebration of agriculture. The Fairgrounds provides nearly $34 million in economic activity to Colorado throughout the year; $29 million of that activity is driven by the annual State Fair event. 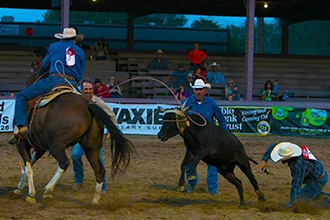 In addition to showcasing Colorado agriculture, the annual event features one of the country's largest traveling carnivals, artwork, crafts, food competitions, thrilling rodeo action, a wide variety of food and merchandise booths and a Fiesta Day honoring Colorado's ties to the Hispanic culture.